You can "Right Click" and choose “Edit Client” or “Double Click” the client in the client list on the CCBoot interface to open "Client Details" dialog box. Enabled: Client PC is enabled for diskless booting. Computer Name: Client computer name. Group: Define the user group that the client belongs to. IP Address: IP address that gets from CCBoot Server. MAC Address: MAC address of the client information. Image: Assign Images to the clients. Note: you can assign only two boot image, for more please use multiboot pxe option and customize the boot file. Note: Please do not use older version (3.0 version and older) image in new version CCBoot or user image created in new verison in older version CCBoot as it lead to client not booting or other boot issues. 1st Server: The IP address of the boot server. If more than one server, you can input more IP address of the server on the 2nd Server field. 2nd Server: The IP address of the 2nd boot server if you have a load balance server running. 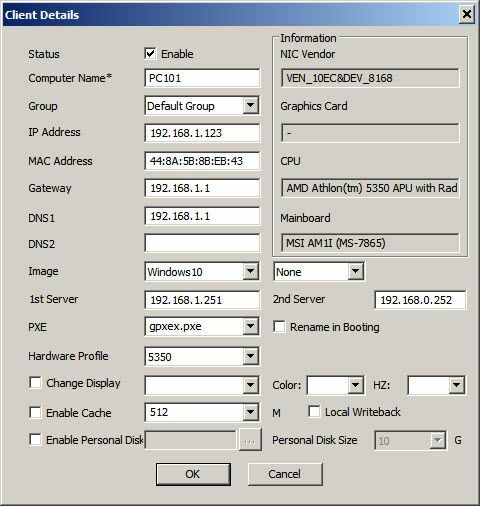 Hardware Profile: To set the client hardware configuration profile. Change Display: If your Client has multiple monitors the resolutions can setup individual client's resolution. 1st is "Resolution", 2nd is "Colour Bit" and 3rd is "Refresh Rate". All fields need to be filled in order for it to be applied properly. You can set them using the drop down or enter custom resolution and other values manually as well. If any field is empty the settings will not be applied and it will default to blank. Enable Cache: Setting the memory to use as a client cache, is depending on the client's memory size. Example: client RAM is 2GB; you can set the 256M to use as a cache. Note: Write to local HDD is used when you have harddisk or SSD on your client but want to boot from CCBoot and not use local HDD for OS or games. This also helps reduce load on writeback disk on the server. It is ok if you see local writeback file have size 0 in explorer. To see right size of file just open properties. Important: Before you enable local write back, make sure that you have connected HDD/SSD in your client PC and has only one partition and is formatted in 32K Allocation unit. Else you may experience client restart or freezing. Enable Personal: Allow you to assign personal disk to the client. Please refer Use of Personal Disk for further information. Note: After you set the personal size, you cannot change it any more. You will have to uncheck the"Enable Personal Disk", then delete the personal disk file.After that you can reset personal disk of you require size.